Finding good deals on bed sheets involves a lot more than just looking at price tags. Understanding how sheets are made, including the fabrics, weaves, and finishes commonly found in sheets helps determine how good of a deal you are getting. Buying sheets can be a daunting task, but buying low-quality bed sheets is a waste of money. It also is a waste of money to buy expensive bed sheets that appear to be top quality but are barely average in feel and performance. When people talk about sheets, the conversation inevitably turns to thread count. This refers to the number of horizontal and vertical threads in a square inch of fabric. Higher counts don't always make for superior quality. Knowing the count is just one piece of the puzzle when determining the quality of bed sheets. Plying is when more than one strand of yarn is twisted together to form a single thread. Single-ply fabrics are made with individual threads, and the result is a fabric that is lightweight and flowing. Fabrics that are two-ply are heavier. In the past, some manufacturers increased thread counts by counting both pieces of thread in two-ply sheets. In other words, a thread count of 500 might just be 250 two-ply threads. Some manufacturers pushed it even further by using four-ply thread, and shoppers started seeing thread counts of 1,000 and even more. The Federal Trade Commission eventually got involved and ruled that plied yarn could only be counted as a single thread when used to determine the thread count. Today, the thread count is perhaps the least significant way to determine the quality of sheets. The quality of the fabric is determined by the quality of fibers used to make the fabric. With bed sheets, the longer the fiber, the better the quality of the fabric. When fibers are twisted together to create two-ply threads, it results in a looser weave that is heavier and rougher and has a shorter lifespan. Knowing this information before you shop helps you select the best product at the best price. If you see a set of two-ply bed sheets with a thread count of 400 for $50 and another set of single-ply bed sheets with a thread count of 250 for $40, the best buy likely will be the $40 pair. The integrity of the $40 pair's fibers is intact, producing a higher-quality fabric than the two-ply, regardless of the thread count. Because of its softness and durability, cotton is most commonly used in bed sheets. But not all cotton is the same. Picture the boll of a cotton plant. It looks like a ball of white cotton candy until you start to pull it apart. Then you will see about 250,000 fibers. When determining the quality of cotton, it is the length of the fibers, referred to as the staple, that determines the quality of the cotton. Short Staple Fiber: 1 1/8 inches long and the lowest quality. Long Staple Fiber: At least 1 1/4 inches long and is high quality. Extra-Long Staple Fiber: 1 3/8 inches to 2 inches long and is the finest quality. American Upland: Known for its shorter-length staple fibers and is the most commonly used cotton found in sheets. American Upland cotton has a rougher feel to it, and it is the least expensive of the other cotton. When a label reads, "100 percent cotton," it most likely made with American Upland. Pima: Known for strength and durability. It is a long-staple cotton fiber that produces a super soft weave and a subtle sheen. It is high-quality cotton with an average cost of around $200 or more per set. Supima: The trademark name used when a product is made with American-grown Pima. Egyptian Cotton: The highest quality cotton. It is the finest and longest staple, producing luxuriously soft, yet extremely durable sheets. 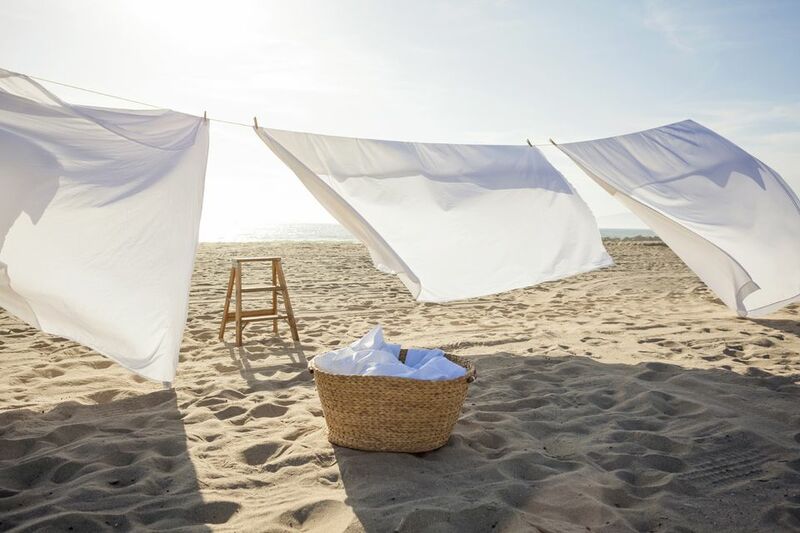 At one time, Egyptian cotton sheets were sold primarily in the more expensive stores, but today you can find them in most linen departments. When buying Egyptian cotton sheets, beware of the many knock-offs that are sold. Real Egyptian cotton sheets will have a fabric tag that reads "Egyptian Cotton." Also, the thread count will be high because of the thin staple. Sheets made of a higher thread count weigh more than those made with a lower thread count. The prices on Egyptian cotton sheets also will be considerably higher. When it comes to buying Egyptian cotton sheets, if the price is too good to be true, proceed with caution. Linen: Kown for its breathability and how well it improves with age. When choosing sheets, it helps to understand how different weaves perform over time. Percale: Also called plain weave, is made from high-quality combed cotton that is tightly woven. The weave produces a soft and smooth finish. Because it has a light feel to it, it is the best choice for people who get hot when they sleep. Flannel: Cotton sheets made with a plain or twill weave and are noticeably soft and pliable. Sateen: Woven using a technique of four threads over and one under, leaving the fabric feeling lustrous and smooth and similar to silk. It also is heavier than other weaves, making it a good choice for people who get cold when they sleep. It is the least durable of the three weaves. Many times, getting a real deal means buying the best quality you can afford. When it comes to bed sheets, it pays off to hold out for the higher-quality sheets to go on sale rather than loading up the linen closet with sheets that lack comfort or durability. Poor-quality sheets often will fall apart within a year of regular use. A pair of high-quality sheets lasts for decades and improves over time.